Updated: 5:55 p.m. | Posted: 10:40 a.m. 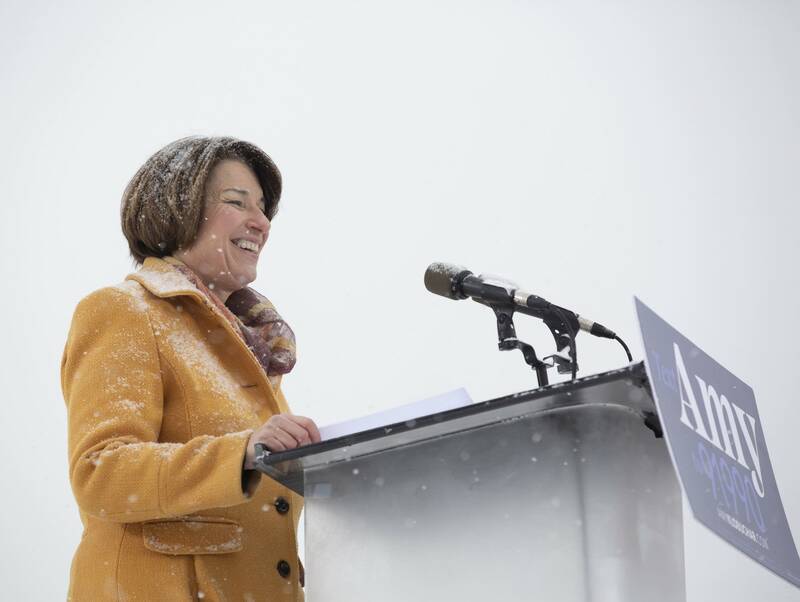 Covered in fresh-fallen snow, looking out on a sea of cheering supporters, U.S. Sen. Amy Klobuchar joined the race for the 2020 Democratic presidential nomination Sunday with a frigid campaign kickoff along the Mississippi River in Minneapolis. "Today, on an island in the middle of the mighty Mississippi, in our nation's heartland, at a time when we must heal the heart of our democracy and renew our commitment to the common good, I stand before you as the granddaughter of an iron ore miner, the daughter of a teacher and a newspaperman, the first woman elected to the United States Senate from the State of Minnesota, to announce my candidacy for president of the United States," Klobuchar told the crowd at Boom Island Park. Video not showing? Watch on the MPR News Facebook Page. The third-term Minnesota senator and former Hennepin County attorney now is part of an already bulging field looking to take on Republican President Trump. And she's one of a historic number of women in the White House hunt, becoming the fifth so far to press ahead with a bid. 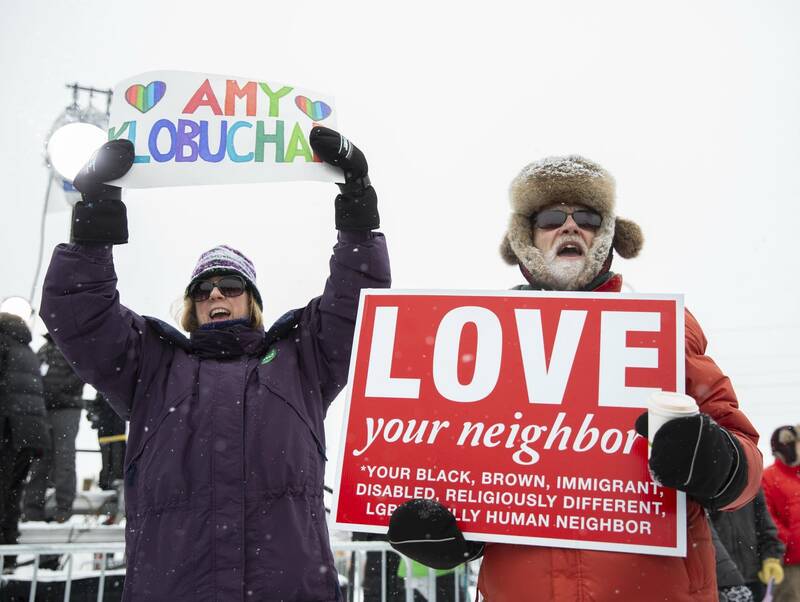 If Klobuchar was going for a tribute to hearty Midwesterners on Sunday, that's what she got. 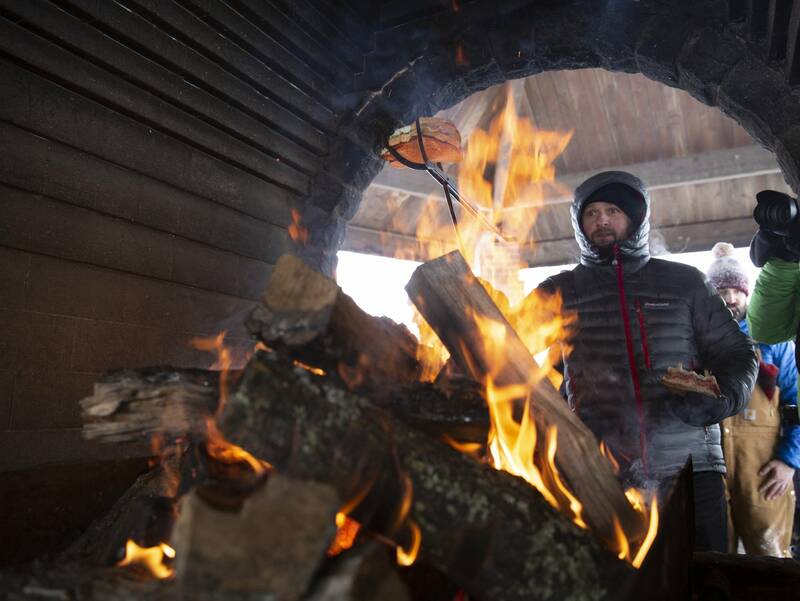 Some supporters arrived at the rally on cross-country skis; the campaign provided hot chocolate to warm early arrivals. 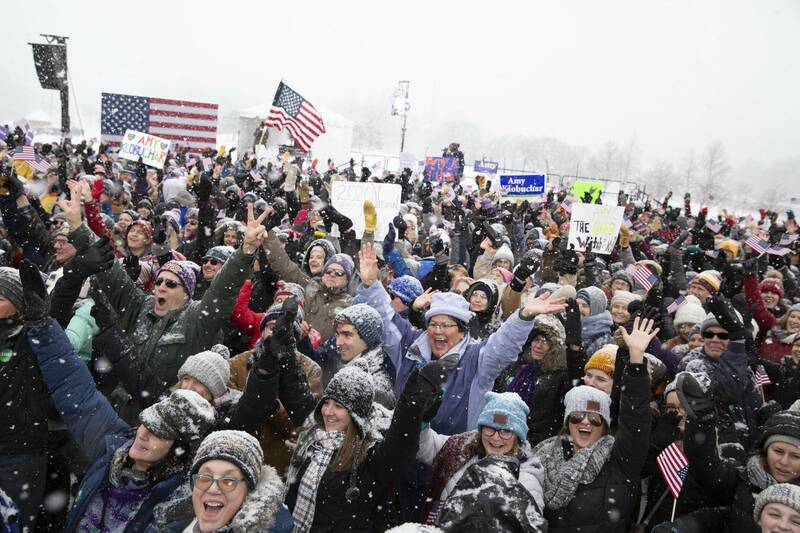 The crowd lifted red and blue campaign signs during the rally, which kicked off with appearances by other Minnesota elected officials including U.S. Sen. Tina Smith and Gov. Tim Walz. Klobuchar's speech drew heavily on imagery around the nearby river that starts in Minnesota and travels south through Middle America. "I'm asking you to not look down and not look away anymore. I'm asking you to look up. To look at each other. To look at the future before us. Let us rise to the occasion and meet the challenges of our day," she said. "Let us cross the river of our divides and walk across our sturdy bridge to higher ground." Klobuchar also presented herself as an underdog in the Democratic race and as a mild alternative to the sharp-edged Trump. "I don't have a political machine. I don't come from money. But what I do have is this: I have grit," Klobuchar told her supporters. "I have family. I have friends. I have neighbors. I have all of you who are willing to come out in the middle of the winter, all of you who took the time to watch us today from home, all of you who are willing to stand up and say people matter." She outlined a platform of fighting climate change, expanding voter protections and tackling income inequality. She also called for net neutrality and a revamping of the nation's cybersecurity, along with "universal background checks and common-sense gun legislation." "There are insidious forces every day that are trying to make it harder for people to vote, trying to drown out our voices with big money," she told the crowd. "It is time to organize. Time to galvanize. Time to take back our democracy. It's time, America!" Even before her launch, Klobuchar had to answer for her managerial style, with some former staff members voicing anonymous concerns of overbearing and abusive treatment. Her office has endured significant turnover throughout her tenure. Other Klobuchar aides defended her as setting high standards and creating a culture where other staff members have gone on to hold higher positions in state and federal government. Speaking to reporters after Sunday's rally, Klobuchar addressed those accusations. She said she has high expectations — for herself, for her staff and for the country. "You know I love our staff — look at this incredible event they put together. And yes, I can be tough. And yes, I can push people. I know that. But in the end, there are so many great stories of our staff who have been with me for years who have gone on to do incredible things," she said. Asked whether she was "tough enough" to take on Trump, Klobuchar replied: "I am tough enough to take on Donald Trump. 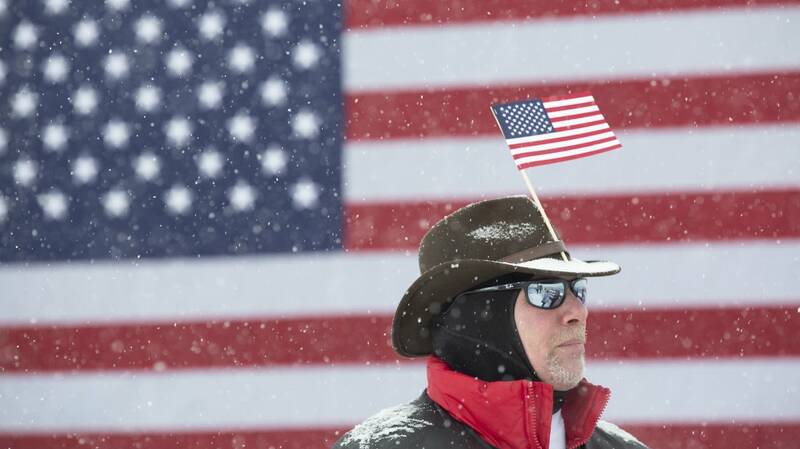 I would have liked to see him sitting out here in this snow for an hour, giving this speech." Within the Democratic field she'll have to navigate from the gate, Klobuchar hasn't espoused many of the hard-left positions that have proven popular with the party base. Instead, she's prone to playing up where she's worked with Republicans on legislation. • Related: What goes into launching a presidential campaign? 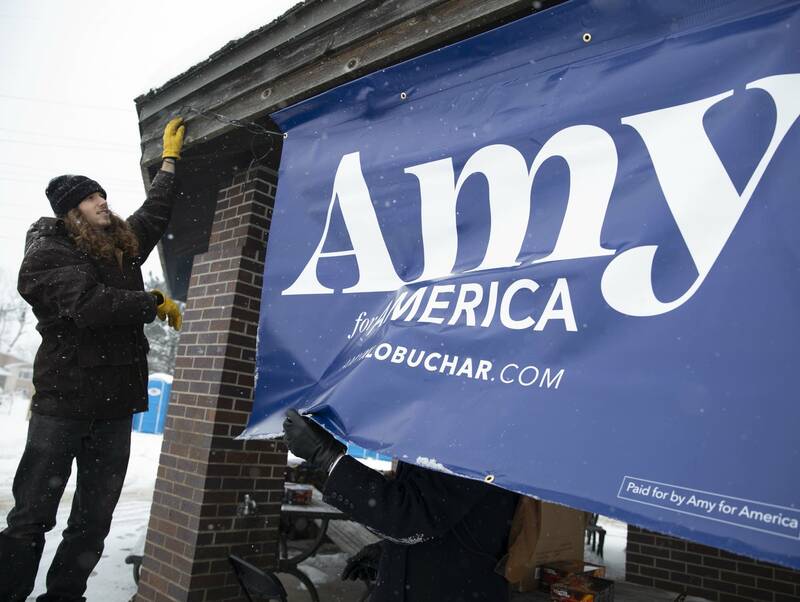 • MPR News with Kerri Miller: What does Amy Klobuchar bring to the party? Klobuchar, 58, convincingly won a third term in November, meaning she won't have to choose between staying in the Senate and attempting to climb the political ladder. As part of that last campaign, Klobuchar pledged she'd serve her full six-year term if she won. "Of course I will," Klobuchar said at an August debate at the State Fair. "I think my track record shows that. I love working in the Senate. I love representing Minnesota." The pledge wouldn't be breached unless she wins, but the demands of a presidential campaign will force her to split time between Washington and the key states on the nominating calendar. Klobuchar is already scheduled to appear later this month in Iowa, the traditional first state to weigh in. Klobuchar has steamrolled her opponents in her Minnesota races, twice topping 60 percent in a state where other comparable contests have produced much narrower outcomes. Her last two opponents struggled to keep her in striking distance or raise money; her 2018 opponent was so strapped he resorted to hammering in his own lawn signs around the state. But that's also meant that she hasn't received significant opposition scrutiny, been subject to searing television ads or had to fight through difficult debates that are common in presidential contests. Critics say she is reluctant to take the lead on controversial issues, preferring instead to focus on easy targets with wide public support, such as swimming pool safety and fighting human trafficking. "She's a senator of small things," said Minnesota Republican Party Chair Jennifer Carnahan. "She puts on this persona of being a nice Midwesterner, but she hasn't stood behind any core issue, championed it or built that seniority out in Congress in her time in Washington, D.C."
Among those in attendance at the rally, Karl Bunday of Minnetonka said he left the Republican Party because of Trump, and said he thinks Klobuchar has the right stuff. "It's important to have people that have that sensibility of the flyover country that actually tips the elections, rather than just the coasts," he said. Kate Seybold of Minneapolis said she liked the speech, and thinks Klobuchar is a viable candidate for president. "She can bring people together from all different walks of life and rural and urban America, so I do think it's exciting to have her running for president," she said. Noah McCourt of Waconia said he votes for Republicans and Democrats — and he, too, likes Klobuchar. "I kind of get along with both sides, kind of like Amy," he said. "I think that the fact that she is so middle ground ... I think she really is going to speak to a large portion of America." While most people in attendance were supporters, a small group of people who supported Bernie Sanders in 2016 said they wanted to see more a more progressive candidate than Klobuchar on the ballot in 2020. Klobuchar's initial challenge will be to ramp up fundraising to sustain a campaign that will require a presence in multiple states at once. She'll also have to build up a network of staff and volunteers. And she will need to find ways to attract attention in a crowded race with some better-known competitors. Klobuchar is planning appearances in Wisconsin and Iowa next weekend. She is just the latest Minnesota hopeful to put sights on the White House. Two former Democratic Minnesota senators — Hubert H. Humphrey and Walter Mondale — got there as vice presidents but fell short in their bids for the top job. More recently, former Gov. Tim Pawlenty and then U.S. Rep. Michele Bachmann pursued the Republican nomination in 2012 but exited the race in the early stages. MPR News reporters Mark Zdechlik and Nina Moini contributed to this report.